One of the greatest writers of the 20th century, and a Nobel Laureate in Literature, Gabriel Garcia Marquez has finally gone down in history. It happened on April 17th, at the age of 87 in Mexico City, where the writer had been living on a regular basis for most of the last few decades. During these last days, the entire world of readers, the whole literary world, and the entire journalistic world, have been in mourning. His homeland in Colombia has declared three days of mourning. It is always sad to realize when one has to accept that a whole era of luminaries is disappearing before your very eyes, and therefore part of your life with it, but your life has been witness to an era of greats. Gabriel Garcia Marquez was a first-class journalist and one of the founders of so- called "magic realism." He became a world notary during his lifetime. As always happens in such cases, the writer's fans are in no doubt that he will live forever, that he is immortal. To some extent, that is true. Marquez has immortalized himself through his literary works, his essays and journalism. It was only when, out of the blue, the news of the death of this "immortal” fell upon the world, that suddenly there was a mass "enlightenment". Yes, death spares no one, not geniuses nor those without talent. But one thing that everyone leaves behind them is their descendants. This is a historical measure of one’s personality. Gabriel Garcia Marquez was born on March 6th, 1927 in the village of Aracataca on the Columbian Atlantic coast. Gabo, as he is affectionately known in Latin America, was the eldest of 12 children in the family of Gabriel Eligio Garcia and Luisa Santiaga Marquez. The young Gabriel became an unwitting witness to the "banana massacres" that swept Aracataca in the first decades of the 20th century, which later became the prototype for the mythical village of Macondo, with its endless banana plantations, reflected in the mirror of Marquez the writer’s magical realism of his imagination. In 1947 Gabo moved to Bogota, where he studied law. He spent five years trying to become a lawyer, but this profession, according to him, was a career that would strike him dead from boredom, so he decided to it give up. However, the young Marquez was captivated by journalism. History records the fact that Gabo had his first newspaper article published at the age of 19, on May 21st 1948. From that time until the last day of his life, Marquez was convinced and tried to persuade others, that "the profession of journalism was the best job in the world." Later, he would write and say this more than once in his memoirs and speeches. Gabriel wrote for the "El Espectador" newspaper, later the "Heraldo", and then for many other newspapers and magazines in Latin America, Spain and the United States. He was witness to revolutions and uprisings, brutal violence and military dictatorships. He did not learn about life from textbooks, but from real life, as a reporter, as a confident and friend of many revolutionary leaders in Latin America. Gabo read a lot. His idols were Kafka, Joyce, Faulkner, Woolf and Hemingway. Marquez traveled extensively throughout Latin America and Europe. He worked in many capitals of the Old World as a reporter for various newspapers. At the same time he wrote short stories and novellas. He managed to create his own personal style of journalism and literature. In 1958, he made a grand journey across Eastern Europe, including the Soviet Union. From his pen came a series of reports called "90 days behind the Iron Curtain." In Paris, Marquez spent 18 months working hard on his most important creation so far: the novel "One Hundred Years of Solitude." The book came out in June 1967, and sold in huge quantities. It was a massive success. Then from 1968 to 1974 Gabo lived in Barcelona. He witnessed the agonies of the Franco regime in Spain. Then in 1975, another of his landmark novels came to light: “Autumn of the Patriarch." Marquez shared his politically left-wing views. He was friends with revolutionary leaders such as Fidel Castro and Omar Torrijos, the Sandinistas in Nicaragua and Hugo Chavez in Venezuela. In 1981 his "Chronicle of a death foretold" was published. In 1982 he became a Nobel laureate in Literature. Part of the prize money of $157,000 was used to purchase his own newspaper in Colombia, for which he recruited young journalists, all below the age of 30. “What virtues do you treat with the greatest respect?” Marquez was once asked. “I had a personal experience of a short communication with Gabriel Garcia Marquez. This happened in Havana in 1990. Then I was working as a correspondent in Cuba for the "Pravda" newspaper, and among other journalists, had been invited to the opening of the "New Latin American Cinema Festival", pioneered and chaired by Gabo. In the "Karl Marx" cinema hall, many celebrities and a large number of Cuban and Latin American cultural figures were gathered together. In those days, in was just not possible for me to meet with Marquez for an interview. Those days, the writer lived in Cuba for a short time, in Havana, which many people knew about, and they requested meetings with him. But they received no replies. It was true, that there were rumors that he was angry over something his fellow journalists had done, and categorically did not want to be interviewed. But hope never left me. However, during the festival, luck came my way. The lights suddenly went out in the hall. The air conditioners packed up. This happened frequently in Havana because of frequent problems with the power supply, transformers breaking down, or simply because of a need to save energy. There was a pause. Some emergency lighting came on, and a door to the street opened. Next moment, I saw a group of Cuban cultural figures with Marquez in the middle. I realized that fate had given me an opportunity. I approached the writer and introduced myself. I told him that I wanted to take an exclusive interview from him for my newspaper, and asked to choose a time and place for the meeting. Marquez did not answer, but it was evident that he was in a cheerful mood. Although his eyes held a sarcastic expression, when he talked about the Soviet Union and Gorbachev. My request about the meeting received no response, but at the same time, with irony in his voice, he asked: "How do you feel about President Mikhail Gorbachev?” To be honest, I was somewhat confused by the question. At this time, I represented the main press organ of the USSR in Cuba, so I was uncomfortable in giving my opinion on the General Secretary of the CPSU. After a short pause, I said firmly that my view of Gorbachev was that he was the head of my state. Marquez then slyly asked me an even trickier question: "So are you with Gorbachev or with us." I replied to him in the same spirit. "I support true revolutionaries all over the world, and Gorbachev has pursued a policy of revolutionary perestroika in the Soviet Union." Gabo smiled with understanding, realizing that he had put me in an awkward position, and pleased with his "creative torture”, shook my hand in a conciliatory manner. After such a "test of loyalty to Gorbachev", Marquez gave me his secretary’s phone number, saying that I should contact him to arrange a date and time for the interview. We exchanged a few words more about the Havana Film Festival and warmly shook hands again. The lights came back on, and I retreated to my place in the "press box", pleased about my agreement with Marquez. So I, for some reason (I can only guess at what) was not among those lucky few who this classic Colombian had given an exclusive interview to. In 2012, when the world marked the 85th anniversary of the Master, "The Year of Marquez", which is also widely celebrated in Russia, a country that Gabo loved and for which his country carried about, as did all of Latin America. When talking about us, he claimed that the most interesting people in the world live in Russia. In our country, Marquez and his works have always been treated with love and respect. As then and now, anybody can enjoy his books. Virtually all of his books have been translated into Russian, and you can buy or borrow them from any library. And I, frankly, am a little envious of those who have not read Marquez’s stories and novels already because of the great pleasure they can expect. In paying tribute to this great writer, Russia will undoubtedly remember the Master, read his books, and share his high humanistic principles, which are so in tune with the Russian soul. His works have entered the personal libraries of many of us forever. Among these books there are: "One Hundred Years of Solitude ", " Autumn of the Patriarch ", " Love in the Time of Cholera ", " No one writes to the Colonel" Living to tell the tell the Tale of my Melancholy Life", "The General in his Labyrinth " and many others . They have been read and will be read anew by generations of people, striking their imaginations and feelings so close to us with their magical realism and philosophy of life. 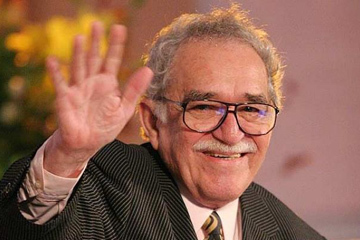 Both in Russia and around the world these days, you can hear the same comments: "Farewell, Gabo! We will never forget you! Your books will help us to better understand life!" 522: 30 seconds to mars. "Farewell, Gabo! "5 May 2014: "Farewell, Gabo! "!